The American Eagle Series of coins from the United States Mint hit a milestone year in 2006. This marked the 20th-anniversary release of the popular coins in the silver and gold range, and the US Mint celebrated amidst rising gold prices and increasing demand for the Gold American Eagle. 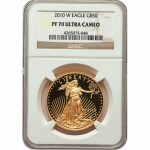 Today, 2006 1 oz Proof Gold American Eagle Coins are available to you online at Silver.com in perfect condition. 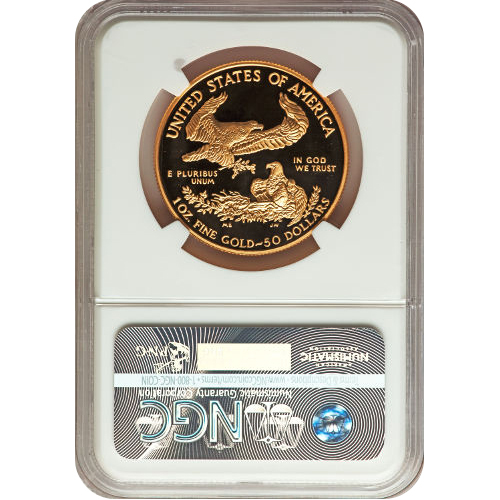 Coins ship to you inside of protective plastic slabs from the NGC! 20th anniversary of the Gold American Eagles! Availability limited within the original 47,092-coin mintage! On the obverse is Lady Liberty. The reverse includes the American bald eagle. The 2006 1 oz Proof Gold American Eagle coin benefited the most from the 20th-anniversary celebration. Its mintage surged the most of any of the four coins in the series. In fact, the 1/4 oz and 1/10 oz coins actually fell in mintage slightly compared to 2005, while the 1/2 oz coin gained a scant 11 coins over the 2005 issue. 1 oz Proof Gold Eagles were available individually in 2006, as part of the 2006 Proof Gold Eagle 4-Coin Set and as part of a special 20th-anniversary set. The latter set had one each of the 1 oz bullion Gold Eagle, 1 oz Proof Gold Eagle, and the new 1 oz Burnished Gold Eagle coins and sold out its maximum allotment of 10,000 units almost immediately. 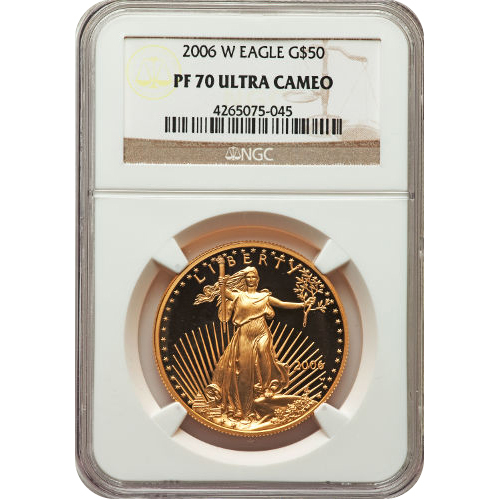 All of the 2006 1 oz Proof Gold American Eagle Coins in this product listing come to you with a perfect certification from the NGC. Coins in this condition showcase full, original mint luster with no detracting flaws visible on the design sets or surface areas. The included UCAM label denotes the presence of strong, frosted designs and deeply-mirrored, clear backgrounds. The obverse of the 2006 Proof Gold American Eagle featured the traditional image of Liberty created in 1907. This design was developed in 1907 by Augustus Saint-Gaudens for the $20 Gold Double Eagle is widely regarded as the greatest American coin design of all time. On the reverse of 2006 1 oz Proof Gold American Eagles is Miley Busiek’s design of American bald eagles. This family of bald eagles surrounding their nest was created in 1986 for this coin series and is found exclusively on the coins in this collection. Please feel free to reach out to Silver.com with your questions at 888-989-7223. You can also connect with us online through our live chat and email address features.